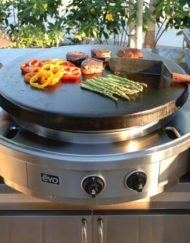 Creole Tacos on the EVO grill are kinda like a New Orleans dish that goes on a South of the Border vacation. 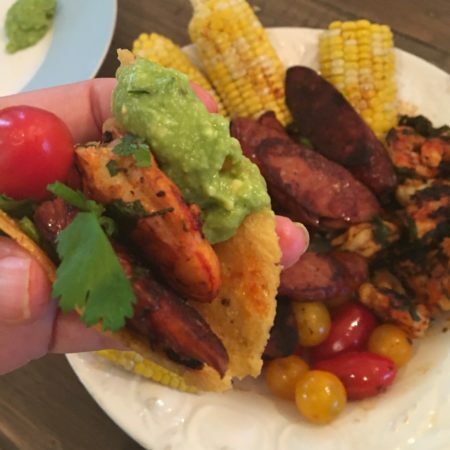 The traditional Creole ingredients of sweet, juicy shrimp combined with smoky, spicy andouille sausage are simply grilled and then tucked into a taco. No roux or sauce making or long simmering. Vacation mode means big flavors but with minimal effort. In lieu of a tomato sauce we use tomatoes simply tossed on the grill to blister. These Creole Tacos can be on your table in 20 minutes, from start to finish. I do enjoy mine served with homemade creamy guacamole, which will add a couple minutes to your prep (and so worth it). But you can use salsa, store bought guac, or leave them naked ( this is a Mexican vacation after all). 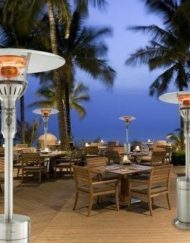 The dish delivers big bold flavors reminiscent of both these favorite culinary destinations. And all with a vacation worthy short ingredient list and quick cook time. Now go use that left over energy to make yourself a nice Margarita! To make this post truly vacation effortless I even made you a video recipe to watch if you want to skip the labor of reading this next part. Just click here to watch it on You Tube. Simply Delicious Creole Tacos. easy enough for everyday but delicious enough to use for entertaining. 1 lb fresh wild shrimp ( frozen for you land bound), cleaned and deveined. I use local SC Shrimp of course. 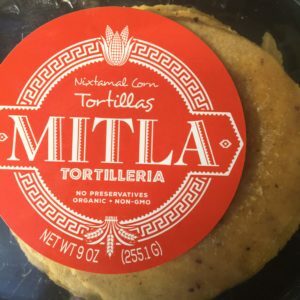 package of corn tortillas ( fresh if possible) Try Mitlas if you can find them because they are fabulous. 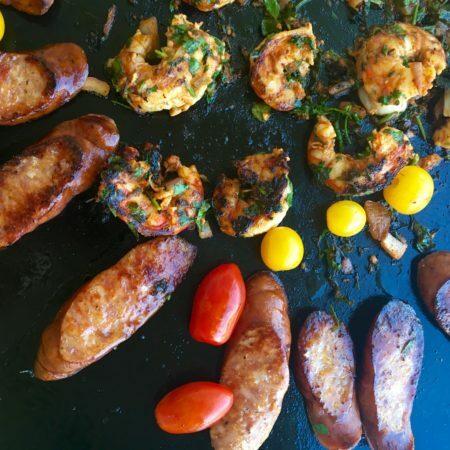 Shrimp gets a quick toss in marinade while grill heats. 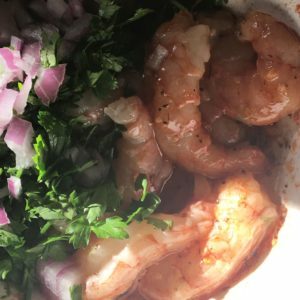 Do a quick marinade of shrimp in bowl with oil, about 2 T Cajun seasoning, garlic, herbs, and onion. 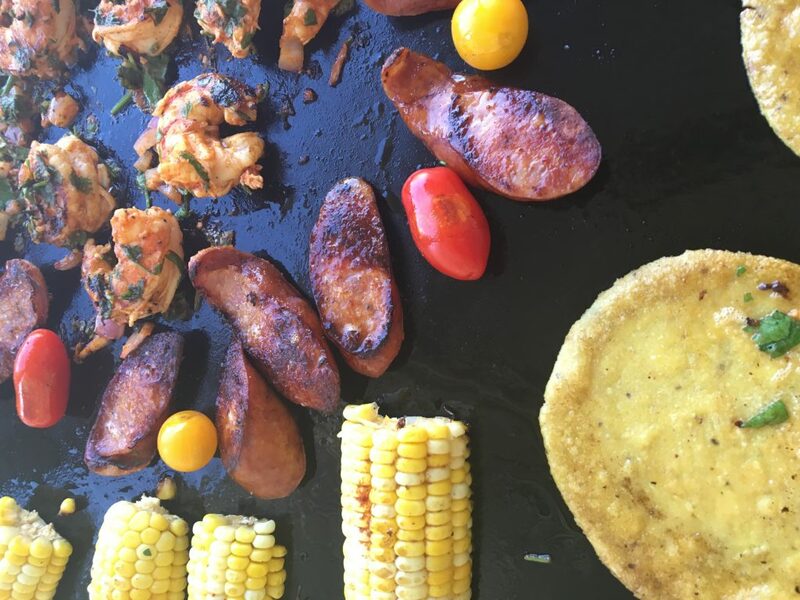 Sprinkle sausage and corn with Cajun seasoning to taste. 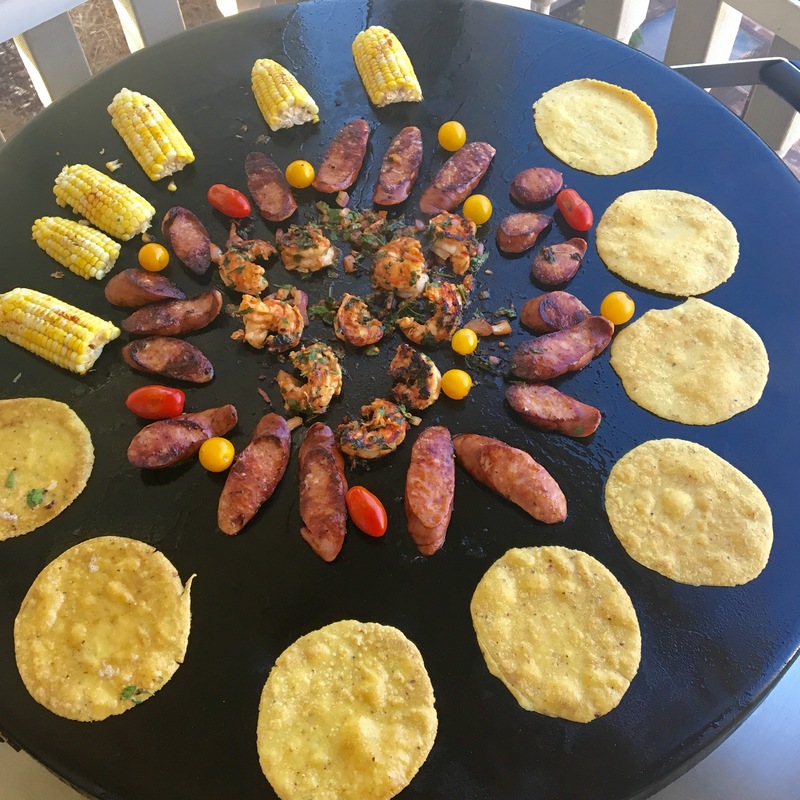 Heat Evo grill ( or pan if using) to med high and add sausage and corn. Sausage and corn go on the EVO first. 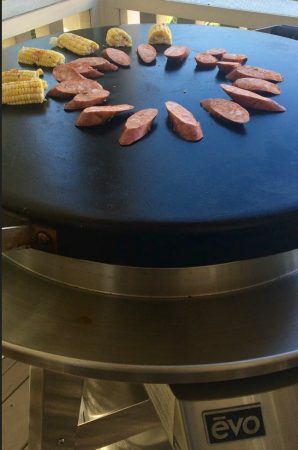 Sausage and corn go on first since they have the longest cook time. Flip after 4 minutes. 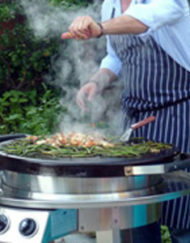 Add Shrimp to grill ( or additional pan if needed) and cook 2 minutes until seared. 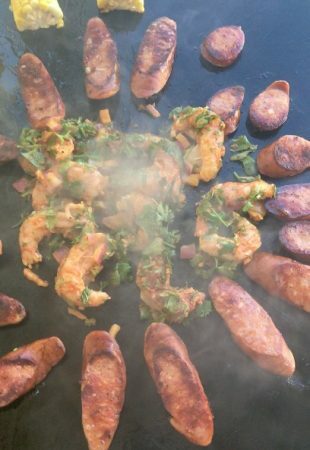 The Shrimp go on in the center of the EVO where you have a separate heat control. Flip shrimp. Add tomatoes and tortillas to grill. Shrimp caramelizes quickly while tomatoes warm and soften. Watch carefully so you don’t let your shrimp overcook and become tough! Criminal. When tortillas begin to bubble it’s time to turn over. I love these handmade artisan tortillas from Mitla. Such a taste and texture difference. Flip tortillas and cook one additional minute. Remove everything and place on platter to build tacos from. Top with guacamole and fresh cilantro if using. Salsa or hot sauce can be used instead. 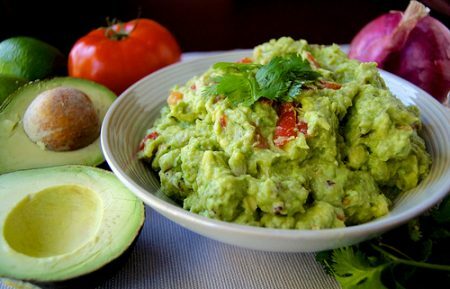 Use the link for a great simple guacamole recipe. And there you have it. Big Bold Southern Flavors with minimal work and clean up. I like to serve mine with fried okra, guacamole, and a margarita. And have been known to devour them directly off the grill, less plates to clean right? Note on the Mitla fresh organic artisan tortillas. They are handmade by a talented Charleston local, Grace Newland and are currently available in several locations including the fabulous Lowcountry Street Grocery, John’s Island Farmers Market, and Mount Pleasant Farmers Market. She also makes a mean flout variety. 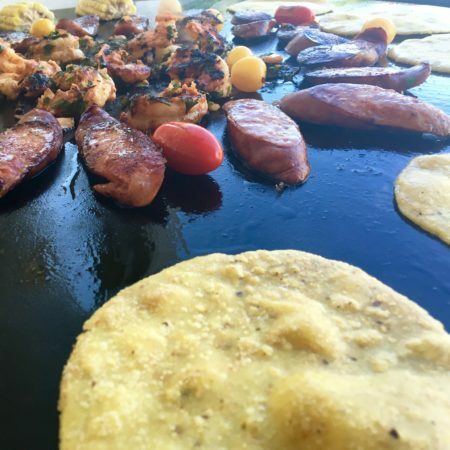 Try to find a local tortilleria where you live if you are not from around Charleston, SC. You will immediately elevate your taco game. 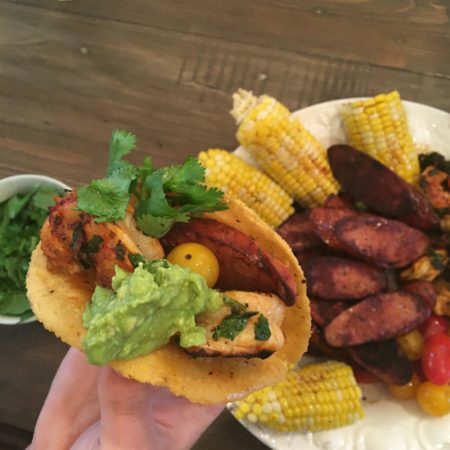 These artisan tortillas are taco night game changers.